Speaker: Dean Baynes, University of Houston Law Center. 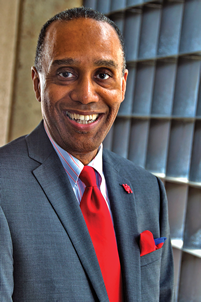 As ninth dean of the University of Houston Law Center, Leonard M. Baynes brings a national reputation as a communications law scholar with specializations in business, media, and diversity issues. Baynes has served as the inaugural director of the Ronald H. Brown Center for Civil Rights and Economic Development at St. John’s University School of Law, as chair of three committees for the Association of American Law Schools, as scholar-in-residence at the Federal Communications Commission, as in-house counsel at NYNEX Corp, and as an associate at the Wall Street office of Gaston and Snow LLP. He has written more than 25 law review articles on corporate law, communications law, and diversity, and is in the final stages of co-authoring the case book "Telecommunications Law: Convergence and Competition" to be published by Wolters Kluwer. He is admitted to practice in both New York State and Massachusetts. Baynes has also been an expert witness at the FCC Federal Advisory Committee for Diversity in broadcast ownership. He was inducted into the Minority Media & Telecommunications Council Hall of Fame, where former FCC Commissioner and MMTC Chair Henry Rivera described Baynes as "a champion for diversity." Dean Baynes' talk will include an overview of his plans for and vision of the law school and his initiative for a new building.